The Procaccianti Group is expected to announce plans Tuesday to “build a premium-branded upscale extended-stay hotel” in Providence, right across the street from the Rhode Island Convention Center and the Dunkin’ Donuts Center, on the site of what is now the John E. Fogarty Memorial Building. TPG already has a 7-year old ‘temporary’ surface parking lot at the site of the Old Public Safety Complex just down the block. It looks like a general hospital, from the eighties. Who wants to make a beer bet that this will still be a vacant lot in May 2019? I won’t miss the Fogarty Bldg., but if they knock it down, can we require the developers to pay upfront for a deposit to maintain a park there if they don’t finish development? (like Salt Lake City requires). That way there’s no danger of a vacant lot. The new building looks almost as ugly as the old, but as long as it’s not full of parking, I give my thumbs up. If I recall, the new zoning for Downcity no longer permits surface parking for temporary uses. I won’t miss this building, but it’s perverse when knocking down a building within what, 500 feet of a vacant space that’s already owned, is cheaper than developing the vacant space. If I had my druthers, any tax stabilization that they will surely seek should come with a condition that they develop their other underdeveloped land. Of course, that might just kill any activity. Another thought– get ready for serious protesting from the employees who have attempted to unionize at The Masonic Temple. And a final thought– I’m still shocked at how strong the hotel market seems to be. It is not clear to me that our market actually needs a “premium-branded upscale extended-stay hotel,” but I could always be wrong. This is on my walk to work, and I marvel every day at what an ugly thing it is. It’s gotta be the ugliest thing in Providence, or close to it. With that said, it isn’t worth investing a dime of public money for bad jobs and parking lots. If we can secure an enforceable agreement otherwise, great. Greg, to be honest, I think the Hilton downtown looks much uglier. It looks so bland and out of place. architecturally speaking, It looks like one of those airport Hiltons. It looks like it belongs in an office park not a downtown area. The Refurbishing only made it look a tad better. I recently was at a travel related meeting and the need for this exact type of lodging was a hot topic by many Providence based companies. Companies often have workers that get assigned to projects that are based in RI and they have to put them up in the suburbs. There is also little to no “corporate” housing in Providence like many other cities have, so this would seem to be a very sound approach. The patrons effectively become residents of the city for weeks or months at a time, so the spill over to food, entertainment, and street activity is a good thing as well. Given the majority of alternatives we’ve seen the last few years, this seems to be pretty good. As for the look and architecture – not my thing to judge, but I do like the overall development in the right direction. I don’t know – if it had been maintained the Fogarty building could have been re-developed. It’s 60’s and 70’s Brutalist architecture and valid for that matter. My only real problem with this is that it’s ugly. I like the park idea. It’s definitely some incentive. 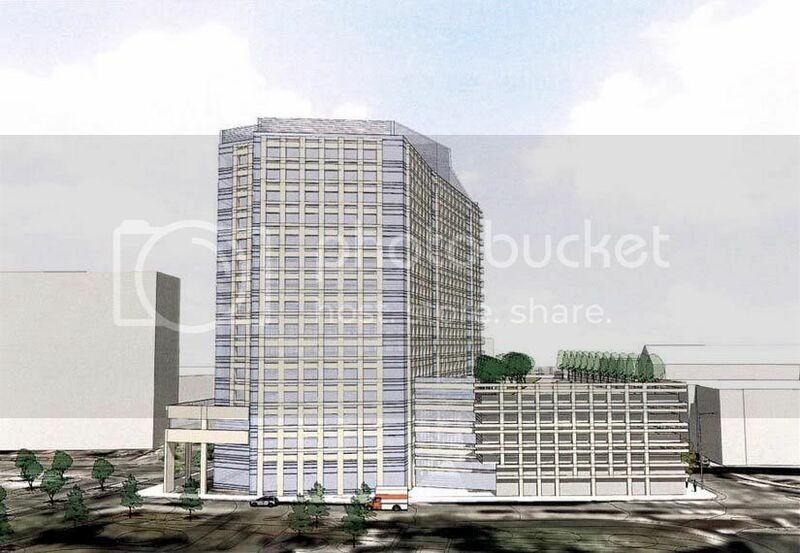 Agree that the proposed building looks dated and ugly, but so does the one they’ll tear down. The window layout of the facade more than likely was dictated by the extended stay hotel program. The architecture may not be the best, but it’s by no means the worst. They made a sincere effort to vary the facade with changes in texture, color, and volume. There’s a defined base, middle, and top to the building and it will have an open active street frontage on Fountain and Mathewson. No one will ever be totally satisfied with the architecture. Some would prefer a more glassy modern expression, while others a more traditional historical design. It’s great that they will be developing a new hotel on this site. 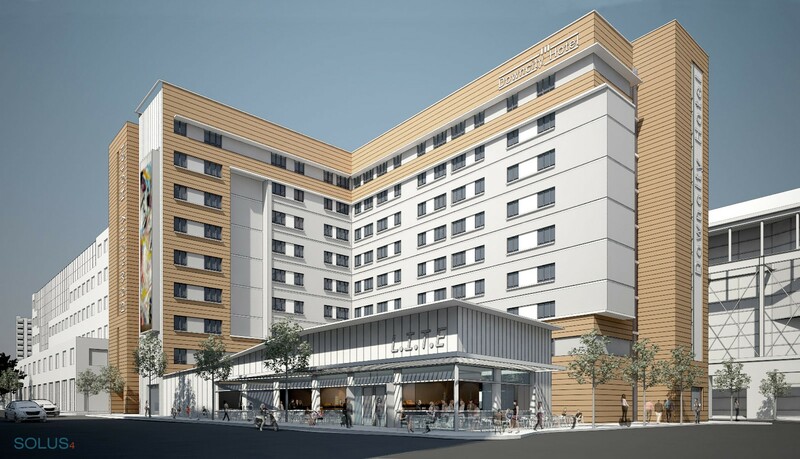 At 60-70% occupancy rates for downtown hotels, 170-rooms will contribute to the continued 24-7 activation of the La Salle Square/Convention Center neighborhood. Plus, the city will get additional real estate tax revenue. Even if many of the hotel’s jobs are low or lower paying, they will support many in the city who lack the education or skills for higher paying jobs. That thing looks like a mash up of every cliche surface treatment in the architectural renderer’s pattern book. Build it next to T. F. Green. Makes the Fogarty Building (which I kind of like for its rigorous brutalist formality) look positively masterly. Peter, at best you’re rationalizing in your defense of the aesthetics of this proposal. I don’t even like Brutalism, but at least the Fogarty is a proud example of the architectural movement it represents. If the best things you have to say for this new proposal are 1) that it has a discernible top, middle, and bottom and 2) that the facade isn’t completely homogenous, then that’s damning with faint praise. A bored thirteen year-old with a working knowledge of Photoshop could produce better. At least the Fogarty HAS a style. This garbage? Not so much. Lewis is right: this would fit RIGHT in on Post Rd near the airport. Now, your point about activating LaSalle Sq, on the other hand, is valid. But as previously mentioned above, Procc could just as well achieve that end by putting this proposed building on the lot of the former Public Safety complex, just a few yards away. And the very same logic logic applies to your points about jobs and hotel occupancy rates. So why demolish? Because this site, directly across the street from from the state’s two premier entertainment venues, is sexier than the old Public Safety site. Only a few yards apart, but that makes all difference. And you know what? Fine. I can accept that. But, that being the case, let’s have a cutting-edge proposal for this high-value site. Ditch the crap. Procc wants to demo the Fogarty, fine, but make the effort worth it. Even if they say their proposed extended stay hotel is luxury or high-end, it’s more likely a mid-level hotel brand. I wouldn’t be surprised by the window layout that they’re proposing an Extended Stay by Westin – mid-range. I acknowledge the architecture isn’t the best. It could improved and through the design process could or should be. If the option is to let them build or not because of aesthetics, I say build. The Fogarty site is only a quarter or a third the size of the old police and fire site. It would be a complete waste to use that property for a 170 room hotel. 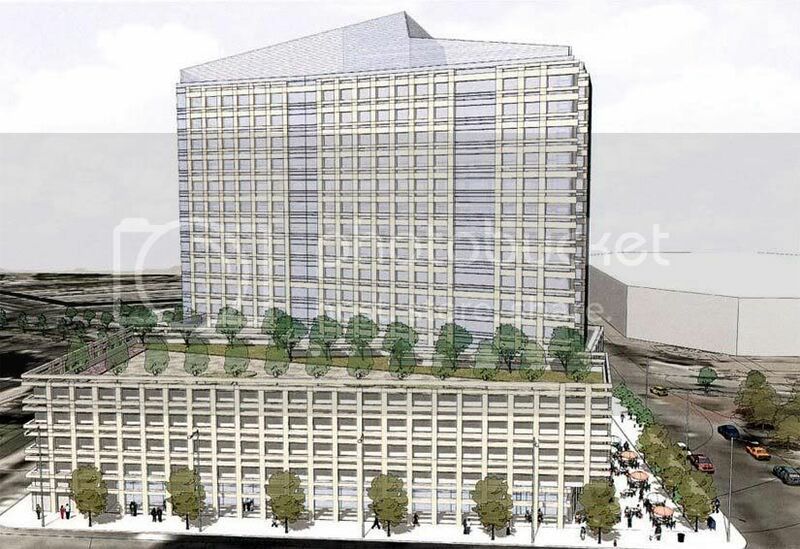 At best that few rooms on that site might look like the Providence Marriott surrounded by a sea of parking. The fire safety is zoned for 300′. There are better uses and it’s worth waiting. A better solution for transforming the Fogarty Bldg to a hotel could be to preserve the facade of the top two floors and other than the columns demolish the garage plinth and first floor. Then construct a grand glassy lobby floor, have function space behind the old facade, and build the L-shape hotel room tower above. I could be beautiful, preserve a portion of the 60s brutalist structure in an elegant way. But, they’ll never do it in the Providence market because it would cost too much. It would be pricey even in Manhattan. Peter, that “better” solution is actually a great idea, regardless of cost. I can actually picture it. It would look pretty awesome (if only I had the skills to draw it out). I actually like the Fogarty building and would prefer to see the facade preserved. Conceivably, they could build their underground parking deck, a hotel building on part of the site, and have a pad ready for future development on the rest of the site. The Blue Cross Blue Shield building was built on a pad over existing parking, reducing the cost of construction of that building. If TPG didn’t have the resources to develop the second part of the site, a prepared pad would be attractive to other developers. The Old Public Safety Building site is set to get slightly bigger as part of the road reconfiguration at LaSalle Square. Jef, any idea when the Lasalle Square road configuration is supposed to begin? Not exactly, sometime this summer. Mental757&Peter have it right here.I also appreciate hearing how the BCBS tower can be a model for the La Salle corridor. Personally I think this hotel ‘look’ has a nice cladding .If this is just a fast track design to propose,then that is good,because most times the design can only improve as the plan evolves. I’d like to see the Convention center side though.That would be the facade that visitors inside the center would see. These are the same people who settled a $25 million dollar debt to the State from the Credit Union shutdowns for $2.5 million so they could but the Westin. Where did you get the rendering that’s on the facebook page? So… there are two extended-stay hotels in the works right now? One on Memorial (triangular lot), and this one? There is also supposed to be a hotel and conference center in the new life sciences complex on the i195 land, too, right? Then the Aloft hotel project on the other side of i95 (if that isn’t completely dead?). This is a lot of capacity — it’s exciting, no doubt, but how about some full-time non-collegiate residences? Adding 800 hotel beds (or whatever it is) is great for downtown commerce (restaurants, retail) and the tax base… but, it does nothing to add to the cultural fabric of the city. Visitors probably spend more money, but in order to get Providence to the next level, we need full-time non-student residents. I’m not sure how many people those 800 beds would translate into if they were residences, but putting 1,000 more people downtown full-time in a few different areas would be very exciting and do a lot more for the City than more hotels. I don’t think there’s an active Aloft proposal for Providence right now.